Even after arriving in California in 1915, Miriam's peregrinations continued. In 1920 she and her second husband moved to Sausalito. In 1922 they left the Socialist Party, and from 1924 to 1932 focused on their work with the Science League of America. Maynard Shipley died in 1934. In mourning, his widow went to Hawaii, then retreated to the East before returning to San Francisco. By the early 1940s, Miriam Allen deFord was living in the Ambassador Hotel in San Francisco, where she resided for all or most of what remained of her life. You can read more about Miriam Allen deFord on a blog called From an Oblique Angle by Joshua B. Buhs, here. She began to publish work of genre interest with "The Neatness of Ann Rutledge" for The Westminster Magazine in 1924, releasing close to eighty sf and fantasy stories over the next decades, mostly in The Magazine of Fantasy and Science Fiction between 1951 and 1970, though several tales appeared later. ["Ghostly Hands"] was originally called "The Neatness of Ann Rutledge" (they chopped off the final "e"), and it appeared in a defunct magazine called Westminster sometime around 1924. Tales of Magic and Mystery apparently just swiped it without notifying them or me--or paying for it. They changed Ann's name to Jane . . . .
Miriam Allen deFord contributed most frequently to The Magazine of Fantasy and Science Fiction, co-edited by Anthony Boucher. Her first story for that magazine was the aforementioned "The Last Generation" from the magazine's second issue. Her last in her lifetime was "The Treyans Are Coming" from June 1974. Like Boucher, Miriam was a writer in the San Francisco Bay Area. The two met in 1943 when Boucher was investigating falls of stones from out of the sky, near Oakland. He consulted with her on similar falls that she had investigated in Chico in 1922. An active Fortean, she and her husband had corresponded with Charles Fort between 1921 and Fort's death in 1932. "We never met in person," she wrote, "but we became good friends on paper." (3) In January 1954, Boucher and The Magazine of Fantasy and Science Fiction published her essay "Charles Fort: Enfant Terrible of Science." According to The FictionMags Index, Miriam Allen deFord's first published story was “Little Bit” in Little Story Magazine for July 1920. (2) Over the next half century and more, she had scores of stories in titles that included Amazing Science Fiction, Beyond Fantasy Fiction, Brief Stories, Double Dealer, Ellery Queen's Mystery Magazine, Fantastic Universe, Galaxy Science Fiction, If, Mike Shayne Mystery Magazine, The Overland Monthly, Real Detective Tales and Mystery Stories, The Saint Mystery Magazine, Scribner's, Space Stories, Startling Stories, Top-Notch, and Venture Science Fiction. Miriam had three stories in Weird Tales and was one of only a few authors who contributed to the original magazine and to the revival of 1973-1974. Her letter to "The Eyrie," quoted above, would have been one of her last published works during her lifetime. Miriam's credits include not only dozens of science fiction and fantasy stories from 1950 to 1974, but also two collections of her own stories, Xenogenesis (1969) and Elsewhere, Elsewhen, Elsehow (1971); many stories anthologized in other books; a number of Little Blue Books; non-fiction books, including Bellamy's Looking Backward (1944), The Real Bonnie and Clyde (1968), and The Real Ma Barker (1970); a biography of her husband, Up-Hill All The Way: The Life of Maynard Shipley (1956); and the editorship of Space, Time and Crime (1964). A few of her stories were also adapted to television. Miriam Allen deFord died at the Ambassador Hotel in San Francisco on March 22, 1975. She was eighty-six years old. See the websites of The Encyclopedia of Science Fiction, The FictionMags Index, The Speculative Fiction Database, and Wikipedia for more on Miriam Allen deFord. You may find more complete and accurate information on the Online Archive of California and the Suffragists Oral History Project, here. (1) Miriam married Collier on February 14, 1915, in La Jolla and divorced him in 1920. She married Shipley on April 16, 1921, in Santa Rosa. That marriage lasted until his death on June 18, 1934. (2) According to Sam Moskowitz in Weird Tales, Winter 1973, her writing career began in 1907. (3) Quoted in Charles Fort: Prophet of the Unexplained by Damon Knight (1970), p. 170. 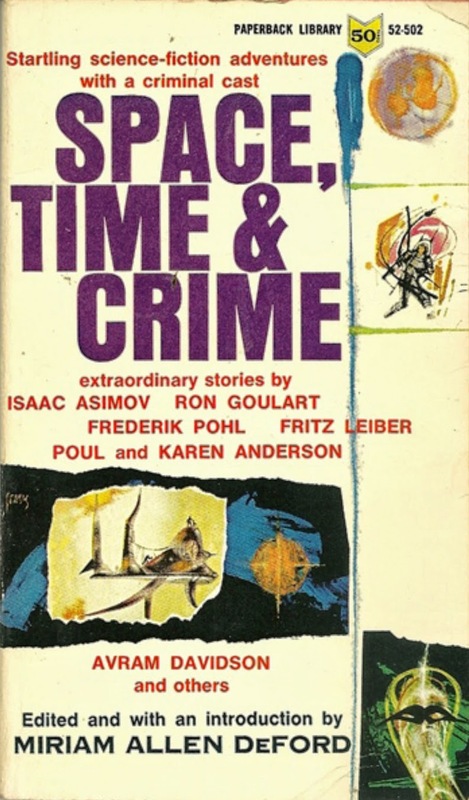 Space, Time & Crime, an anthology edited by Miriam Allen deFord, in the 1968 edition with a cover by Jack Gaughan. 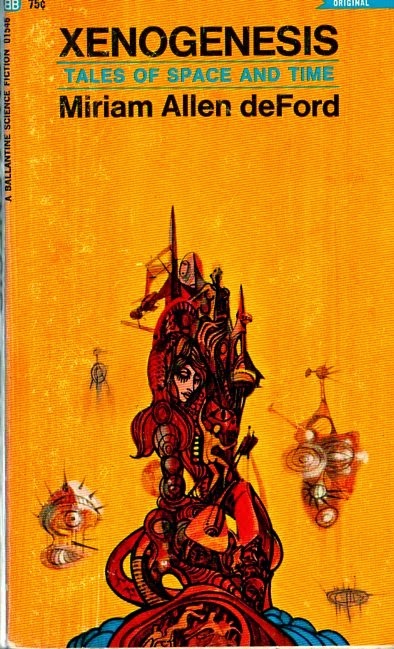 Xenogensis (1969) with cover art by Richard Powers. 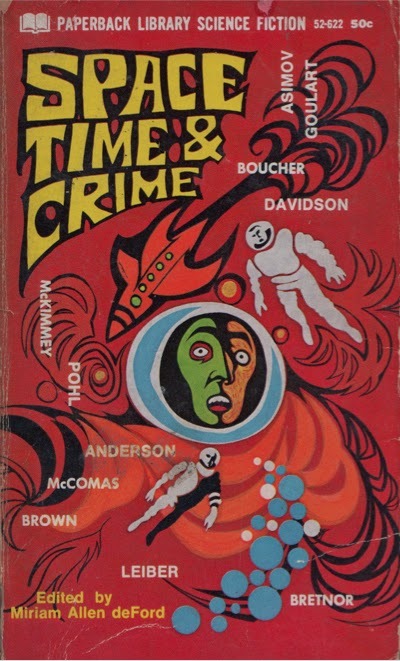 Update: Another edition of Space, Time & Crime, this one from 1964 with a cover by Richard Powers. Hi - I'm an exhibit developer working for a San Francisco museum. We have an exhibit featuring deFord, and would like to use the two book covers that you have on this page (http://tellersofweirdtales.blogspot.com/2014/10/miriam-allen-deford-1888-1975.html). Would need hi-res versions. Please contact me at tishacl@gm. .. ail.com.